Do you get good value for money out of the TK Synergy S1 Plus Deluxe hockey stick? This is the main focus of my review on the 2015 model of this hockey stick. There is little doubt that purchasing a TK hockey stick is a good buying decision, however with the Synergy S1 Plus Deluxe priced at well over £200 at many UK retailers, I want to review it’s value for money. For clarity this review will be focused on the Synergy S1 with the famous TK “Late Extreme Bow”. For further clarity the TK hockey range of sticks that are labelled as “Plus Deluxe” carry this shaft as the only difference over the other models. Also before I move on, you can buy the Synergy S1 Plus Deluxe in Europe for much less, if you are going to go to a Christmas market this year (or have friends who are) perhaps put this on your shopping list instead of cheese and sausage! 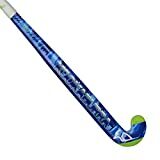 To really understand whether this hockey stick is in-fact value for money I had to put myself in the position of a buyer, luckily enough I have a guy who bought one in South Africa (cheaper again than the UK price) so in the true spirit of a consultant I asked him! Looking at a buying a new hockey stick is an important move for someone trying to advance his or her game. You need to balance your skills now, with skills you want to have, with your budget. Obviously with the Late Extreme Bow on any TK hockey stick you are making a choice to develop drag-flicking skills. The Synergy S1 therefore looks an appealing option. But there are other sticks out there that exploit the FIH rules with curve extremity and position, so this alone doesn’t justify buying the Synergy S1 Plus Deluxe alone. Other than drag-flicking, what else can the Synergy S1 Plus Deluxe do for its user? I’m obviously not going to say, “throw aerials” because that’s a given with such a bow and to be honest you don’t need this curve to do that. Often we get a little obsessed with how this shape curve is perfect for drag-flicking we forget the other techniques are helped with this layup. With such a low and extreme bow the TK Synergy S1 Plus Deluxe can massively improve your first touch on the ball. When under pressure you want to receive the ball and bring it under immediate control ready to feed it on to a teammate or turn and dribble. The lowest bows can help with this by cushioning the ball and trapping it quickly at the bottom of the shaft. So the Synergy S1 Plus Deluxe is actually very multifunctional at least because of the Late Extreme Bow. This stick actually isn’t just about the bow though. This Late Extreme Bow will take some getting used to but the hitting power from the Synergy S1 Plus Deluxe is up there with some of the hardest hitting sticks around. So you get the ball under control easily and hit hard too, how can you justify that as value for money? – I always think buying a TK hockey stick is an investment. How many old TK sticks do you see on your pitch? These things are built to last under tough playing conditions. Week in, week out, I can see you thrashing this TK Synergy S1 plus deluxe around the pitch for at least a couple of seasons. Yes it might start to look a bit dog-eared and covered in tape but I can see it soldiering on and most importantly still performing for sometime to come. So for the purpose of my review I wanted to ease off the technology talk and just discuss whether the Synergy S1 Plus deluxe is good value for money. You get the ability to do some really advanced skills in trapping, hitting hard and 3D dribbling. You get TK hockey stick durability, which will make it last for a long time. Plus the Synergy S1 Deluxe is full of all of TK’s amazing technology. All the features with 3 & 4 letter acronyms I am refusing to explain individually in this review are, in my opinion a sign that TK have put real love in to the manufacturing of this stick. My answer is yes! The Synergy S1 Plus Deluxe is an absolutely fantastic hockey stick for the money. James is absolutely over the moon with his and although it took some getting used to, it is helping him seriously improving his game.